You are at:Home»Featured»AVA advises the public not to approach, disturb, feed or try to catch any wildlife! SSSSSSTUCK NO MORE 🐍] On Tuesday morning, AVA were alerted to a python sighting in a canal drain at Queen’s Road. 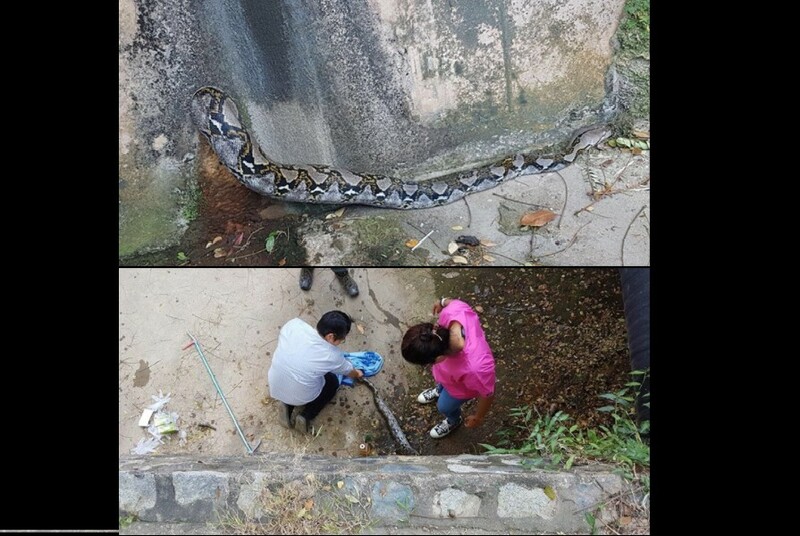 When AVA arrived at the scene, the python was found stuck in the canal pipe, with one-third of its body exposed. The python was successfully rescued after a few minutes and sent to Wildlife Reserves Singapore, where it is doing well now. AVA advises the public not to approach, disturb, feed or try to catch any wildlife. Keep a safe distance from all snakes and avoid confronting or cornering the animals. Do not interact with the animal, and ensure that young children and pets are kept away as they may be curious and approach it. The public can refer to the advisory on snakes on our website, and contact AVA at 1800-476-1600 to provide feedback or request for assistance. Next Article MERC DRIVER WAS CAUGHT DRIVING AGAINST BY TP ALONG HAVELOCK SQUARE!